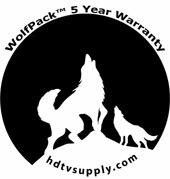 HDTV Supplys WolfPack AHD to AV Adapter converts an Analog High Definition AHD signal to one channel HDMI™/CVBS/VGA/YPbPr outputs and as well as has an AHD loopout going up to 1,500 feet. The AHD to AV Adapter comes with a scaler that will allow you to adjust the output signal to 720p/1080p that is compatible for an HDMI™/VGA/YPbPr enabled display as well as an 480i(NTSC) or 576i(PAL) for the CVBS output. The AHD to AV Adapter helps reduce equipment cost by eliminating the need to convert to each individual analog component by offering a solution that converts any AHD™ source for use with multiple displays. For hassle-free installation it is a plug-and-play solution that requires no software or driver installation. NOTE: Coax cable distances measured using Belden 1694A Cables. Why not buy this AHD to AV Adapter today? HDTV Supply includes a 5 Year U.S. Limited Warranty on this AHD to AV Adapter. There are two bundled parts to this 5 year warranty. The 5 year warranty is only for the main device you purchased and does not include any product options or additional products you purchased at the same time. FIRST YEAR: The first year is direct with with HDTV Supply at 800-841-9238. The warranty states that the AHD to AV Adapter will perform substantially in accordance with the supplied written materials and Product information located on this Product web site page for a period of 1 year from the date of shipment of the Product and that the Product will be free from defects in materials & workmanship under normal use & service for a period of 1 year from date of shipment.